If you have users in your course that require special conditions for taking a quiz or submitting an assignment (new in 2018), you can create a user or group override that changes the settings only for those particular users. This can be useful in cases where any students need a bit longer to complete a quiz, for example if a student has a computer crash while completing a quiz and needs an extension to the quiz time limit to complete it fairly; or they require additional time to complete an assignment due to an illness. Group overrides can be useful if you have a multi-section course with different submission dates or times for each different cohort. 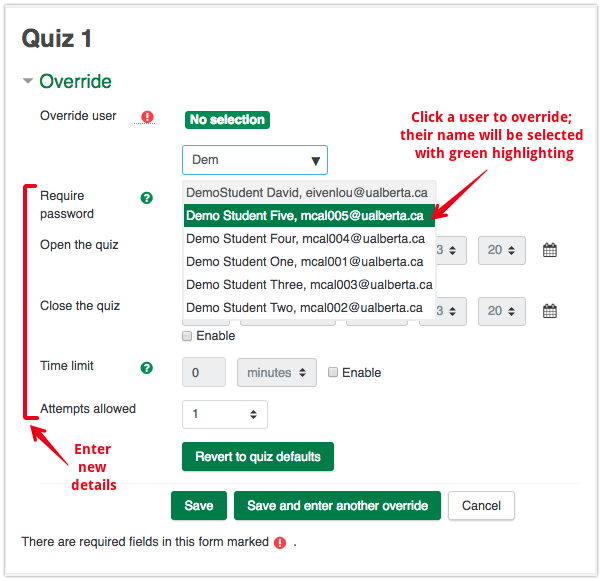 Adding a user or group override allows you to keep the same quiz or assignment and add as many different overrides as required for that particular activity. All other users complete the quiz or assignment with the original conditions created within the quiz settings. Enter your course and click on the quiz or assignment you would like to create an override for; then click on the gear icon, then on either Group overrides or User overrides. Note: You must already have groups created in the course to use the group override functionality. Click on Add user override. Select a user in your course, and make changes to the quiz delivery settings as required. Be sure to save your changes. The interface for entering Group overrides is the same - any changes specified to all members of that particular group (groupings are NOT required to limit changes to a particular group). When you re-enter the 'Overrides' interface, a list of any existing (previously entered overrides) will be available on top of the Add user override button. 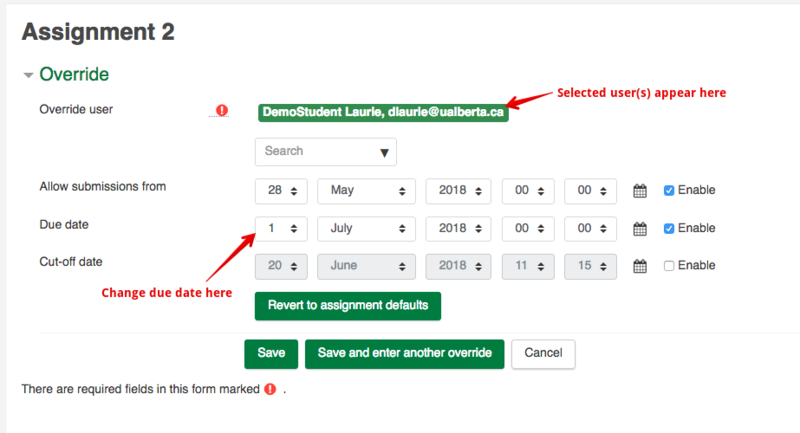 You can adjust the quiz or assignment delivery details for an override by clicking the gear icon or remove an override completely by clicking the 'x' icon. The "copy" icon can be used to copy an override to another user.